The New York Times recently noticed that, when old folks move to be near their children, that does not necessarily mean frail elders who are themselves in need of care. For the young-old, the lure of being near their kids and grandkids is often coupled with the draw of a fun place to live, or at least to visit a lot. How smart our children are to have settled in someplace that we don’t mind being! What a great excuse to change old habits, even put the old homestead on the market. My favorite example was a long-divorced Midwestern couple who were sharing, on an alternating basis, a Manhattan pied a terre down the block from the grandkids. Talk about civilized behavior! 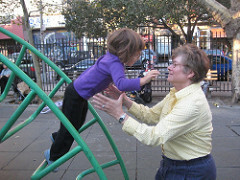 During the brief period when my own kids and grandkids lived in the hipper reaches of Brooklyn, I noticed that the playgrounds were full of chic French grandmeres, as well as a regular rotation of preppy Mimis from the high net worth towns of Connecticut. Many of these visitors alight for longer and longer periods of time, learning to settle their cappuccinos into the cupholders of the citified strollers, pushing kids in playground swings with one hand while yakking on the phone with the other. Each generation defines itself anew. What fun when we old people can enjoy some of the perks our kids have invented!